The dolls are busy this week building a doll house general store. 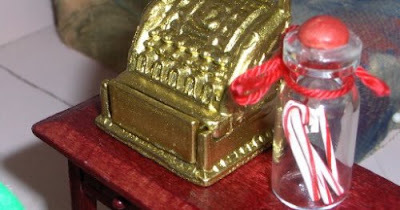 Yesterday I had the occasion to be in A.C. Moore and I saw the most adorable little doll house cash register and jar of candy canes. As a bit of "building background" the general store will be located in a shelf I found on sale some months back at an antique store. 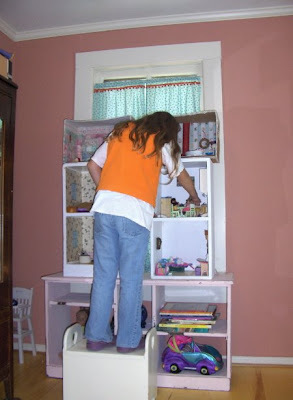 This shelf, which serves as even more rooms for doll house adventures, I think was an old cabinet with doors -- thinking maybe 50s or 60s. It was cleaned up and painted and sold to me! But I'm sure one could be found at a thrift store as well for even less. Just be patient and keep looking! You can see Princess of the Universe playing in front of the shelf, on which sits the doll house. It no longer holds books and toys, but is a wonderful extension of the doll house. Anyway, I had to travel out of my snuggly old home yesterday for a work meeting, and on the way I stopped at A.C. Moore to see if any doll house things caught my eye. It took awhile, but finally the candy canes spoke to me the loudest. And then the cash register. For just a few dollars, every once in a while, I love to find little things to bring home to Princess of the Universe and her dolls. Little things like this add a fine touch to the doll house that I cannot always figure out on my own. 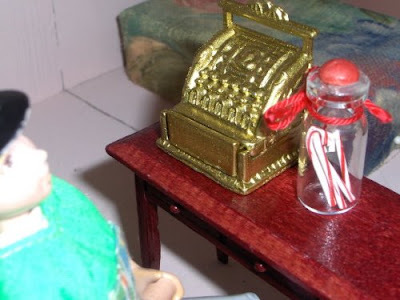 Upon examining the cute little cash register, the wheels in each of our minds began turning. I'm not sure who thought of it exactly, but we decided to install a doll house general store beneath the dolls' home. It will be a wonderful place to put "leftover" furniture, lamps, and of course the supplies that any doll family would need. I promise you'll see pictures soon of the Doll House General Store, as well as some other things we've worked on. A doll house is such a useful thing. I love the candy canes! I've yet to start our dollhouse, but it is my mission before the year is finished!